With technology playing an increasingly important role in our lives, large numbers of traditional businesses are adapting to new ways of working; embracing solutions that streamline workflows and make huge efficiency savings. The residential valuation and property risk management sector has experienced considerable advances as more players move to online solutions and the importance of supplier selection for lenders and surveyors cannot be underestimated. Several high profile cyber security incidents have dominated recent headlines, serving as a timely reminder that such breaches can affect more than just big-name companies. The rapid spread of the Wanna Cry ransomware attack in May saw more than 230,000 computers in over 150 countries affected, from big organisations like the NHS to smaller companies and individuals. Choosing a partner with the right credentials is critical for discerning clients looking to ensure the confidentiality, integrity and availability of their data. Knowing what to look for can be a challenge but a good starting point is identifying a technology provider with a recognised industry information security accreditation. ISO27001:2013 is one such standard, specifying the requirements for establishing, implementing, maintaining and continually improving an information security management system within the context of the organisation. Systems availability considerations should take a similar priority. Organisations using Tier 4-aligned data centres demonstrate the highest levels of availability, with architecture able to cope with the most serious of technical incidents without server ability being compromised. Data encryption is paramount and an organisation’s cryptographic policy should detail arrangements for storage and transfer of data, outlining adherence to cryptographic protocols such as TLS. 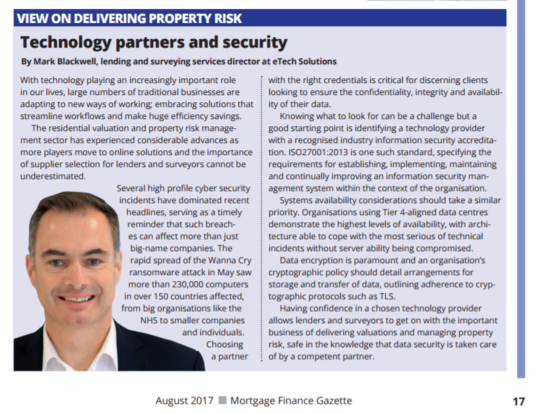 Having confidence in a chosen technology provider allows lenders and surveyors to get on with the important business of delivering valuations and managing property risk, safe in the knowledge that data security is taken care of by a competent partner.